As you view this post, I am hanging out with my daddy and probably being kissed by my brother the wolfdog (Matouk). Yes, I'm away... for EIGHT whole days!!! Hopefully this time won't be as bad as the last time when it was time to head home, and I had to walk into the airport and leave my daddy standing behind me. I almost couldn't do it. I was literally sick to my stomach (that's one way to avoid the need for lipozene LOL), and I wanted nothing more than to turn around and run back out of the airport and jump in Dad's truck and go back to spend more time with him... ummmm indefinitely. Yes, I'm 35 years old. Who cares? You can still be a daddy's girl at 35 years old! Fabulous shot! So glad you finally got to photograph it. I know how you feel when you talk about your daddy--I still feel that way about mine too. Enjoy your 8 days!! A great shot of that bird too. This critter is beautiful, he is kindly posing for your camera! Beautiful shot, Misty. You are so lucky to have your Dad. There is nothing wrong with being a Daddy's Girl. Enjoy him (and your wolf bro). 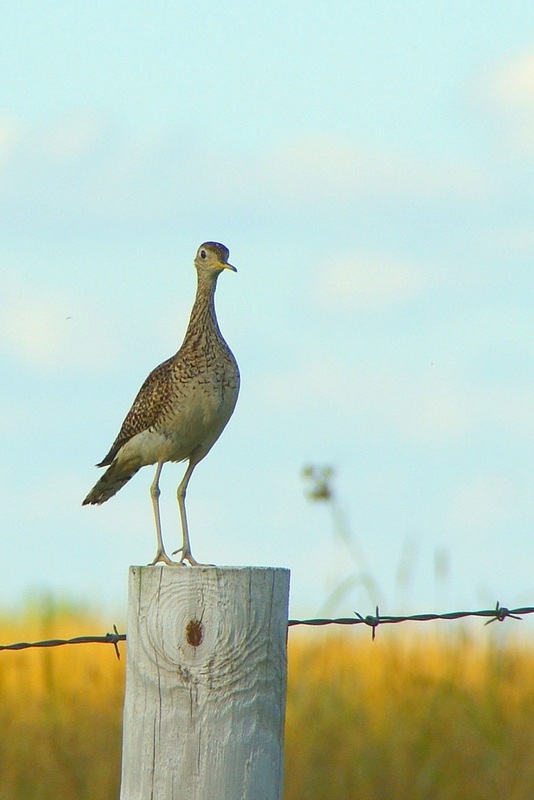 Awesome shot of the Upland Sandpiper. The colors are fantastic looking. Nice tall, pretty bird and a nice love and respect you have for your father. I love the bird's expression!! What a fabulous picture! Love the soft blue background... Enjoy your time away. Wonderful shot of the "Wind-up" bird 8v) I do like that extended neck look...hehe. What a lovely creature! It does look like it's posing for you. Have fun with your dad! I just spent some time at my parents so they could play with my grandson. I did most of my post there. My mom went for a haircut part of the time, and my dad and grandson were in and out of the room where I was working. It was fun hearing them interact. That is a beautiful shot of the wind up bird. How unusual..
How elegant and beautiful a fantastic shot. This is a perfectly composed shot. A very elegant bird, defiantly trying to pose for you.